Nestled perfectly into Kissing Tree’s scenic Texas Hill Country’s rolling terrain, the course measures just over 6,500 yards from the back tees. “The trick of designing within a residential community is to create a course that is strategically strong and enjoyable, while creating value with golf lots and views of beautiful open space,” said Stephenson, who has collaborated over the years with legendary masters of the game such as Byron Nelson and Phil Mickelson. Nelson, in fact, inspired Stephenson’s design style. Years ago, when they collaborated on a golf course in Idaho, Nelson urged Stephenson to bring golf back to the ground. And that advice was taken seriously. Studying and playing courses in Scotland during the three years when he worked at St. Andrews, Stephenson decided Nelson was right. A course doesn’t need super long fairways and penalizing hazards to be a challenge — Stephenson promises to include dramatic shots and scoring choices. For example, the shortest hole on the course — the 130 yard, par 3, hole 6 — will be a challenging play off the tee over a dry creek bed to a green protected by a wrap-around sand bunker. The second shot on hole 14 will also be beautiful and very challenging; especially if the player chooses to go for the green in two shots. The Kissing Tree Golf Course will consist of many spectacular views. On the front nine, the view from holes 4 and 5 will be an especially nice view — “holes 4 and 5 are higher on the mountain and will have long views to the south and west,” Stephenson said. On the back nine, the view from the hole 12 tee looking southwest over the 11th green will be equally bucolic along with the view to the north from the 14th fairway. 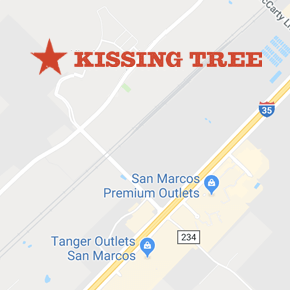 The Kissing Tree course will be Audubon-certified – signifying that the environment, wildlife and the natural landscape were considered in the design and will drive the course maintenance practices. “The routing was done to try to preserve as many prominent natural features as possible, and to use them as strategy and aesthetics for the golf course,” Stephenson said.